Brooks Robinson played his entire 23-year career with the Baltimore Orioles and was elected to the Baseball Hall of Fame in 1983. He began his professional baseball career as an 18 year old with the Orioles, and gained great renown for his fielding ability. Nicknamed "The Human Vacuum Cleaner", he is generally acclaimed as the greatest defensive third-baseman of all time. He won 16 consecutive Gold Glove Awards during his career. 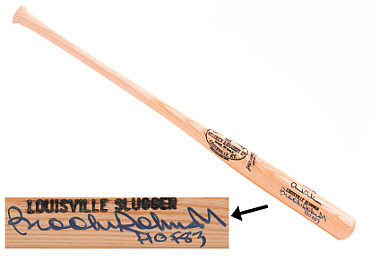 Brooks Robinson has hand signed this H&B Louisville Slugger Engraved Ash 125 Game Model Bat with HOF 83 inscription. Beckett Authentication Services Hologram and Certificate of Authenticity.